A tiny uninhabited isle in Sagamore Creek has been offered for sale at a bargain price that the City of Portsmouth may not be able to pass up. Many governments and conservation groups around the world are buying back private islands, some paying into the millions of dollars for rare island habitats. One city in New Hampshire, though, may get to purchase its own island for an incredible price that is too good to refuse. Portsmouth was approached directly by the owners with an offer to sell the island, and it has been debated by the city’s leadership for the past several months. The small isle is one of just a handful in the Sagamore Creek channel, which is surrounded by salt marsh and biologically important New England wetlands. The island, whose name is currently unknown, was originally part of a plot of land purchased by condominium developers for the Tidewatch project, a set of spacious upscale homes bordering the creek that sell for upwards of US $700,000. At less than an acre in size, the tiny island could hardly hold a cabin, never mind a luxury home – this may be why, according to a representative of the owners, the asking price is just $25,000. Previous assessments were rather higher, ranging from $98,000 in 2009, to a steep $153,200 in 2011. A recent abatement request was granted by the city, however, and now the property value has been brought down to a mere $21,900. Mark West, a local environmental scientist who was commissioned by the city to do a report on the island, said that the island was important for conservation purposes. His report, which was sent to the Portsmouth City Council, found that the island was clean and relatively free of trash, and could be used as a nesting habitat for birds like ospreys. Aside from conservation, possible uses proposed by the city for the island include recreation; a kayak trail runs by the island, which could be a handy stopover point for resting tired arms and enjoying the scenery. Rocks along the island’s 1,400 ft shoreline could also make for a popular swimming spot at high tide. In his report, West suggested that the island may even have some archeological significance, as it would have been a likely spot for Native American fishing camps. 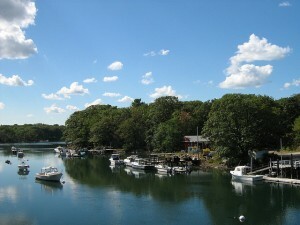 As reported in the local Seacoast newspaper, he also recommended that the island be considered a “unique habitat”, as it is only one of three islands in the creek. In any case, with a price that low, the island will no doubt be a great investment for Portsmouth – and one that future generations will be grateful for.